I recently discovered the cool site, I Heart Faces, and decided to participate in this week’s challenge. After retiring from my teaching/writing/editing profession, I’ve very recently begun to capture family and children’s portraits, and learn some tricks in PhotoShop. 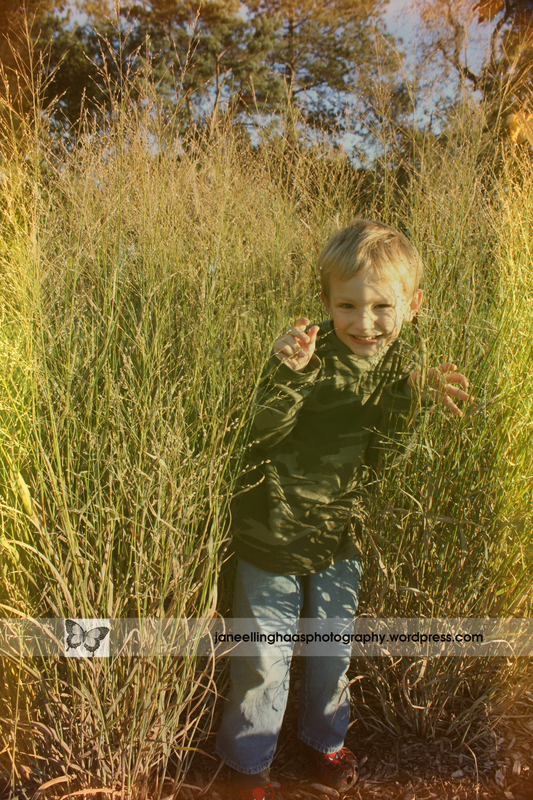 I took this photo of great-nephew Hunter who pretended he was a big cat and prowled in the natural grasses in Forest Park, St Louis, site of the 1904 World’s Fair. The grasses provided great texture in the SOOC shot. But then I added the PhotoShop CS4 Sunspot Texture with an opacity of 30% for a golden glow. This entry was posted in Children, I Heart Faces and tagged Children, I Heart Faces, natural light, St Louis area photographer of families and children. Bookmark the permalink. So fun, I like the warm look! Thanks Janie! Your so sweet! I Love yours too! WAHOO for I heart faces! They are awesome! i love the sunshiney feel of the photo and the tall grass is a great frame! This is just the cutest thing! I love the tone the texture added to the photo! I love the natural textures in your picture! Great shot! Love the warm glow effect. Jane, your photography blog is wonderful. You are soooo talented! All your photos are amazing…love the special effects you have achieved and the “faces” posts are beautiful. You have perfect models to work with, but it takes real talent to achieve such remarkable results. Congratulations!! !